A group of riders led by Alvaro Bautista during practice for the MotoGP British Grand Prix at Silverstone Circuit. Nearly four miles of track at Silverstone Circuit in the UK got a full repave this year for the first time since 1996, after complaints of increased bumpiness. The new stuff was smooth at first, but rapid degradation made for a bumpy Formula One race and a canceled MotoGP event. 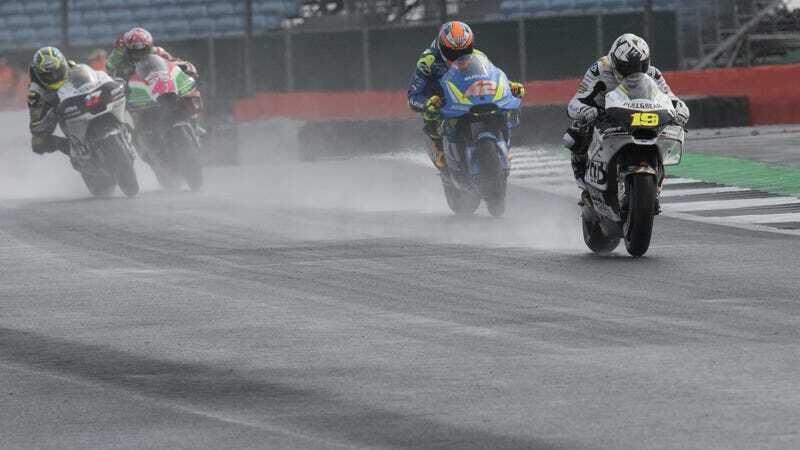 MotoGP was supposed to run at Silverstone over the weekend, but heavy rains and standing water on the track led to a full cancelation of the race. Series race director Mike Webb blamed called the cancelation “a direct result of the track surface,” according to Autosport. Racer later reported that the track is looking into an investigation of what made the surface so impossible to work with. “This year with the new surface is the first time we’ve encountered quite so much standing water in critical places of the track. 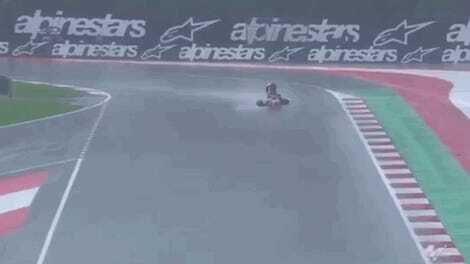 “When we’ve been running here in heavy rain, the circuit in some places is not safe because of the way the water does not drain from the surface. Repaves usually help with weather delays, at a high cost—there don’t seem to be any numbers out for Silverstone, but the recent repave of 1.5-mile NASCAR track Texas Motor Speedway cost $5 million, according to the Dallas Morning News. Silverstone is more than twice that length. But Reuters reports that a Honda statement talked about “drainage issues” at Silverstone’s MotoGP weekend, and the new track surface wasn’t looking great before then. During F1 in July, some drivers thought the new surface was better and others thought it was worse than the 22-year-old surface was. The odd thing is, F1 could be partially to blame. 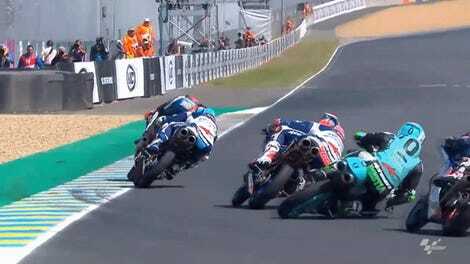 Autosport reported in 2017 that rider Cal Crutchlow felt bad for tracks hosting both series, because of the belief that new, higher-downforce F1 cars are shifting track surfaces—making them bumpy enough for MotoGP riders to say something. The belief, Autosport reported, is that cars ripple braking zones and push asphalt across the surface in fast corners with high downforce. Silverstone posted a video on Facebook after the MotoGP cancelation, with the track’s managing director Stuart Pringle saying the long wait just to cancel the race was “absolutely not what [the track] had planned.” He mentioned money spent on tickets, and said the track would contact buyers “to explain what [it’s] going to do.” That’s a cryptic way to allude to a potential refund. “I do not accept the criticism of the circuit and resurfacing because none of us have the data to substantiate those claims,” he added. “It’s conjecture and completely overlooks the significant rainfall that fell on the day and caused many other events across the country to cancel.